Reader Question: Hey Sara! I've read your blog for a little while now and instead of renting dishes (which is so not in our budget), I found a resource for biodegradable plates made out of sugarcane (I didn't want to use corn products. We use waaaay too much corn!). Here's my problem: My town/city is SO behind on the green movement. The closest recycling center is about 40 miles away and they don't do neighborhood pickup. So, my partner and I made the decision to get biodegradable plates. So...what do we do with them after? Hopefully, our families will put them in the designated bins to begin with, but how do we dispose of these plates? We don't have our own yard to compost in, so I'm at a loss at what to do with this earth friendly plates, despite the fact I've been googling for hours! Matt and I faced the same dilemma for a couple of days. Fortunately, the innkeepers of the B&B where we were having the reception volunteered to take it upon themselves to solve the problem for us. Phew! 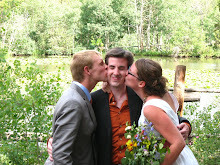 (What a testament to finding a wedding venue with an amazing staff!). 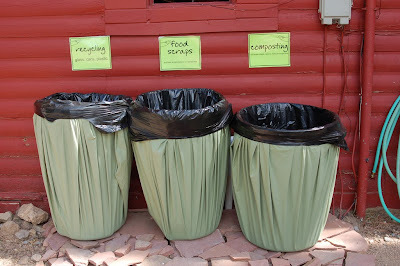 They located a facility that would compost our table ware, set up the bins, and took care of transporting everything. Recruit an eco-conscious friend to help you tackle this problem. Perhaps that friend would be willing to drive everything to the nearest facility (assuming the carbon footprint associated with driving 80 miles is worth it...). You have a lot on your plate right now (pun intended); see if you can find a passionate soul to help you! Put an add on craigslist or other neighborhood websites to see if you can find someone who has any useful information. You might be able to find someone who has a giant backyard composting facility or who has some other ideas. It's worth a shot! I hate to say it, but if none of your strategies pan out, I would suggest you just throw the stuff away. Every decision we make lies at the intersection of several different values. On the one hand, you care about the environment (hooray!). On the other hand, you probably care about your sanity. I say put your best effort forward to solve the problem, and then let it go. At the very least, your money is going toward products that are more eco-friendly. Your purchase helped create more demand for such products. At least it's a step in the right direction. 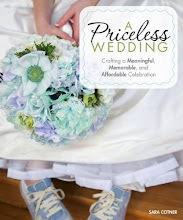 Brilliant 2000dollarwedding kindred spirits: Any other ideas or thoughts? Hi. Just a thought, if they're biodegradable plates, then theres no need to stress, when you toss them out with the rest of the trash, they may go into the landfills, but there they'll biodegrade peacefully, and harmlessly, which is what you want. So really, you shouldn't even worry about tossing them. Sigrid - would that were the case - sadly, if compostable items are put into landfill, they decompose without air, and make methane rather than carbon dioxide. And methane is a 20x stronger greenhouse gas than carbon dioxide. The best bet is put an ad on craigslist or similar and ask if anyone wants food scrapings etc for their compost or ask family/friends. Or ask the venue to compost it for you. Failing that, reusable is better than putting it into landfill really, but Sarah is right, somethings are just not going to be perfect. Just do what is feasible. I agree that you just have to do the best you can given your resources. Unfortunately, biodegradable items throw into landfills do not "biodegrade harmlessly and peacefully." This is a common misperception. Landfills are essentially dry cells, and the conditions are not such to allow biodegradation. It wouldn't be much different than tossing any other (non-biodegradable) plate into the landfill. What about using green garbage bags as well. You are still throwing them out, but I think the bags decompose within a couple of months. i'm so happy that you are considering the afterlife of your biodegradable flatware. a lot of people think they are doing the planet good just by using biodegradable materials without realizing that they need to be composted rather than sent to a landfill to actually biodegrade. so even if yours don't make it to a compost pile due to logistics, i applaud you for bringing this issue up and thinking about it carefully. i vote for craigslist too - there might be someone out there who'd love more scraps for their compost pile. We chose biodegradable dishes, silverware, and cups. Our sanity became really important, as we could not find an industrial composting facility, and the company specifically says that higher heat than a farm/home compost pile is necessary. So, we threw them away. Yes, they go to the landfill, but at least the plates were made of reclaimed materials, not freshly made styrofoam. I believe that it's important not to feel guilty about our choices, but to make the best choice you can at the time. Whatever solution you find, I'd suggest having a "trash police" to keep track of what gets tossed where, or even to go so far as to have designated people clearing tables to ensure that things get sorted properly. 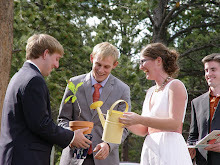 We used "tree-free" plates (bagasse), cups, utensils, and napkins at our wedding, had 3 separate carefully labeled bins (compost, recycling, garbage), made a special trash sorting announcement, and had a plan to get rid of each bin's contents in its proper place - and sadly, people were REALLY bad at sorting. Lots of compostable and recyclable stuff ended up in the garbage. Nothing ended up composted. I was really sad but no one had the time or energy to dig through the trash and re-sort everything at the end of the day. At least the compostable tableware I bought supported the local business that makes it, and no trees were harmed for our wedding - but I hate that all that stuff is sitting in a landfill. At least you know they are not made from petrochemicals. plastic is forever, at least your cane plates are not. I second craigslist, or kijiji. You may have a friendly relative who would be willing to make the drive for you (road trip!) or perhaps they would accept it in the mail? I would call the 'nearest' facility to find out. I was told that with the specific sugercane/bagasse disposable plates I bought, they WOULD degrade in regular landfills, although not as quickly or well as in a composting facility. I'm sure this depends on what, specifically, the plates are made out of--I know the corn ones just break down into pellets if they're not in a commercial composting facility. For anyone who's wondering why it's all so pedantic about compostable/bio degradable etc etc. Bottom line - everything 'degrades' it's a matter of how much time, how much GHG and how many nasties left behind. We struggled with the exact same issue. Our wedding is at our parents home and they don't have recycling in their rural area. I wish I had the forethought of a previous commenter to call local farms! We decided that it was ultimately worth spending the money and renting dishes that could be reused with just a wash. There were a couple of reasons why including the recycling/composting issue : we couldn't find utensils that were sturdy enough for our liking, and we didn't like the idea of "plastic" cups on the table. But it was a hard financial decision for us! My sister just had her wedding and she purchased mason jars for glasses, saved the tops and we are reusing them for canning this fall. She also collected coffee mugs and silverware from people who had extras they didn't need. 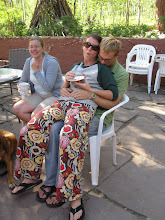 After the wedding she donated the silverware and mugs to a local shelter. For plates she did have compostable plates, but we have several friends who compost so it wasn't a problem. For the barbecue the night before the wedding, we used plastic plates from the dollar store. True, they aren't compostable or biodegradable, but they are replacing literally hundreds of disposable plates. That's because we still have them, and we take them anywhere that we would be using disposable plates. My brother and his wife borrow them to take to church picnics -- there are enough of them that no one needs to use disposable -- I take them to work every time we have a staff breakfast or special lunch, so no one uses disposable, and I've even started taking them to the fall and spring dinners at my kids' school. Because they are cheap and unbreakable, they function perfectly in place of disposables. I don't care if we lose a few, so I don't stress out about lending them any time there's a big gathering.